The finale -- Happy New Year! 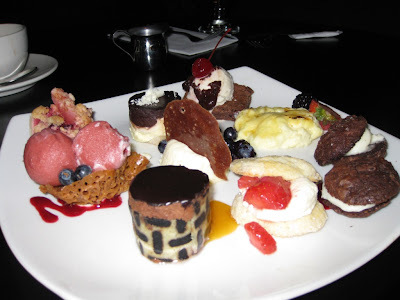 The above treats were sampled and shared recently at the "finale" restaurant in Cambridge, Massachusetts with a friend who was visiting from Hong Kong. The article, "Old Ideas Spur New Approaches in Cancer Fight," in today's New York Times is a MUST-READ! In it, a reference is made to an article published in The Lancet in 1962, and written by Dr. Smithers, with the quote: Cancer is no more a disease of cells than a traffic jam is a disease of cars, Dr. Smithers wrote: A lifetime of study of the internal combustion engine would not help anyone understand our traffic problems. The article goes on to demonstrate how results in "old" research papers are starting to ring true. Fascinatingly, the Times article begins with a female researcher, Mina Bissell, recalling how one of her research papers on the genesis of cancer was heaved into a waste basket by a prominent scientist twenty years ago. Her thesis: gene mutations are part of the process of cancer, but mutations alone are not enough. Cancer involves interaction between rogue cells and surrounding tissue. The above statement reminds me of a traffic network with individual cells or drivers in cars competing for resources from the supply of the infrastructure. Interestingly, several years back I heard from a group of medical researchers who were intrigued by possible analogies between the Braess paradox and cancer-targeted therapies. The therapies were not working out as expected and it seems that the concepts fom transportation networks of user-optimization vs. system-optimization might be relevant. In fact, I included a note on this in the presentation that I gave as a Science Fellow at the Radcliffe Institute for Advanced Study at Harvard University that year and mentioned it in my talk and discussion. A few weeks ago, I heard, once again, from one of the medical researchers who also sent me several articles from the biological/medical/oncological scientific literatures. As I tell my students, acquire as much knowledge as you can in your studies, since you never know when you may be applying different tools and methodologies in your future work. Interestingly, last June, while on the Traffic panel at the World Science Festival, the organizers had the prescience of convening a biologist (Iain Couzin of Princeton University), an operations researcher/economist/network scientist (yours truly of UMass Amherst), and an architect (Mitchell Joachim of Columbia University) to discuss traffic and its solutions! I will be reading the materials forwarded to me by the medical researchers carefully and hope that what is old and even from other disciplines can shed new light and insights into one of the most challenging medical issues of modern times -- cancer and its cures. If you would like to learn more about networks and their fascinating applications, please listen to the podcast interview with me by Barry List made possible by INFORMS. It's the time of the year when family members, friends, and colleagues send out cards and newsletters, which are always a treat to read and allow the reader to catch up. It is fascinating to see what is included in the writeups. As we look forward to the New 2010 Year, I am pleased to share with you the new edition of the The Supernetwork Sentinel, which is the newsletter of the Virtual Center for Supernetworks. This newsletter captures some of the wonderful activities of our Center Associates, who include students, academics, and leaders in industry. You can access the latest edition and previous ones here. I have been writing this blog about infrastructure, networks, research, and education since I began the RENeW blog in January 2009. The blog was initiated for two reasons: 1. because I had been approached by a good number of people to start one and 2. I was finishing writing the Fragile Networks book with Patrick Qiang and blogging was a way in which to get news out and to also inform. Being an educator means keeping ties to students, even after they graduate, and to numerous colleagues and interested individuals, and this means of communication seems especially timely. Throughout this semester, while teaching my undergrad transportation & logistics class, the students and I discussed associated events as they were occurring in the real world, from the closure of the San Francisco Bay bridge to the closure of the Lake Champlain bridge, along with the engineering, economic, and business consequences. We talked about passengers who were stranded on airport tarmacs for hours on planes before their release. We talked and learned about transportation modes and their variants around the globe. We came to truly appreciate the importance of transportation and logistics as networks that tie us all. These and other stories continue as we near the New Year with President Obama passing a regulation that airlines on national flights cannot keep passengers on planes on the tarmac for longer than three hours without large financial penalties. Ah, the math modeling possibilities that now present themselves and colleagues in transportation and operations research have been recently quoted in the press on the associated scheduling and rescheduling issues and possible ramifications! However, all of my "stuck on the tarmac for 4 hours" stories have involved international flights so I guess I am not off the hook. At the same time, we are reading about passengers being trapped in the Eurochunnel for hours with the Eurostar train shutting operation for days because of, supposedly, "unusually powdery snow entering the engines." In addition, due to a power failure yesterday, Amtrak had to shut train operation in parts of the Northeast yesterday for hours (during one of the busiest travel seasons of the year). Nevertheless, another theme for one of my blog posts was that of Boeing's production problems, which, for the time being, seem to have been now resolved, with the new Boeing 787 Dreamliner recently soaring over Washington state (2 years late but at least it can get up and fly now) . This is a fascinating case study on outsourcing and what happened. The New York Times is now reporting in this NY Times Bridge Article that the Lake Champlain bridge that joins Vermont with New York State will not be repaired but rather will be imploded next Monday! The article demonstrates the huge impact on the communities from, first, the closure of this bridge last October and now with the heart-breaking news that this bridge will be destroyed. A lifeline for citizens is lost as well as an elegant (but one which needed lots of repairs) structure. I wrote about the closure of this bridge in a letter to the editor that was published in the Boston Globe last month. Last March we traveled to Austria, since I was invited to give a seminar at the Vienna University of Business and Economics. We landed first in Innsbruck, where we spent a few days since we wanted to reconnect and see friends and townfolks that we had interacted with back in 2002 while I held a Distinguished Chaired Fulbright at the University of Innsbruck. During our 4 month stay in Innsbruck we lived in the house featured above in the first photo, which was owned by a professor at the university. The address was 94 Schneeburgasse. We had heard that the house had been sold and condos had replaced this magical villa with views of the Alps and the 1964 Olympics ski jump. We wandered to see our former neighbors on Schneeburgasse last March and were welcomed with hugs. Above I also include the photo of the condo complex that replaced the villa (with several of the units not filled). Let's take great care when we destroy the old. Beauty in design and function should be preserved also for its living history. Now, we will have to just make do with some photos and incredible memories -- the same holds for those whose lives have been forever changed because of the removal of the Champlain bridge. This decade is coming to a close and it certainly has been a tumultuous one. In an era of Facebook and Twitter it is time to reflect on what really matters and to make sense of it all in a week in which one had to attend both funeral wakes and holiday parties. Last night, my daughter asked me to view the movie, "The Gods Must be Crazy," with her. She had seen it at the Bement School from which she had graduated last Spring and wanted to see it again, perhaps to try and make sense of so much that seems to be unexplainable these days. We laughed and laughed during the movie, especially during the hysterical transportation and vehicle parts. At the end, after a tense climax, the world seems well again through the simplicity of family life and community. The setting of the movie is Africa. Last winter, my daughter and her ninth grade classmates from the Bement School, along with several of their teachers and a medical staff person, traveled to the Dominican Republic to help out at the La Suiza orphanage for a week. The orphanage is home to about 40 boys. The experience was profound for all those that took part and the students came to understand the importance of giving and sharing. Last week, my daughter received a phone call from a journalist from our local newspaper asking her what inspired her to give to the Toy Fund. The interviews with her and another teenager appear in today's Daily Hampshire Gazette. Her name is misspelled but the lasting impact of helping out and the experience in the Dominican Republic linger. She is now a student at the Deerfield Academy, which also has a tradition of community service both in neighboring communities and abroad. As for trying to make sense of it all, let me recommend a book of poems by Professor Frederick C. Tillis, which arrived at our door with a very special inscription. The name of the book is Beginning again and I find it very fitting as we start a new decade. In the meantime, I have heard from Dr. Dennis Hanno, the undergraduate dean at Babson. Dr. Hanno was a former colleague of mine at the Isenberg School of Management, and also a former neighbor in Amherst. He is an amazing individual, educator, and administrator. I urge you to read the commentary on his blog regarding the recent OpEd piece in the Boston Globe that I wrote about below. I am adding this link today (December 24, 2009) due to the uproar created by the OpEd piece. Please read Dean Hanno's commentary here. In today's Boston Globe there is an OpEd piece written by Kara Miller, who teaches at Babson College. The article is entitled, "My lazy American students," and the author writes how she prefers having students from other countries in her classes since she feels that they have a much better work ethic, despite their, perhaps, poorer English. I found this OpEd piece painful to read and insulting to all the hard-working students, American or international ones. This past semester was not easy with the H1N1 pandemic, with many families losing jobs and income because of the recession, among other additional stressors on both students and faculty alike. I would like to counter the arguments in that article and say, in contrast, my students at the Isenberg School of Management at UMass Amherst were terrific this past semester. They showed up to do their presentations despite a big snowstorm. They showed up at their final exam besides it being dark and cold outside (and the heat was up to 80 degrees for some reason in the exam classroom). ALL of my students handed in their presentations on time and the students in my undergraduate class at the Isenberg School of Management were some of the best and the most hard-working ones I have ever had the privilege to teach. American students are terrific as are the international ones! Interestingly, in my undergraduate class this term I had only one international student (from Hong Kong) whereas in my graduate class I had only one American student with all others being international ones. As I have heard it said before "Apples don't fall far from the tree." Faculty serve as role models and are as much at fault if the students don't do well as the students are themselves. Honestly, if you can't say something nice perhaps it's best to let it be left unsaid. Learn More About Innovation and Scientific Research in South Africa and Beyond, the Smart Grid, Vaccines, Robust Optimization, and Supply Disruptions! 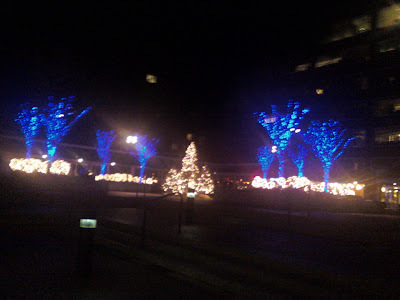 In the Northeast we have had a major snowstorm and it is a winter wonderland! The course grades have been submitted and before we catch our breaths, it gives me great pleasure to announce the Spring 2010 UMass Amherst Speaker Series in Operations Research / Management Science. Please be sure to mark your calendars and to join us,if you can. This series is now in its 12th semester of continuous operation and is open to the public. All talks take place at the Isenberg School of Management at UMass Amherst on scheduled Fridays in Room 112 from 11AM until noon. I can share testimonials of audience members who have written to me and who have taken the time to thank me regarding our past speakers. Let it suffice to say that when undergraduates, grad students, faculty, and those from industry who have come to hear our speakers say that on Fridays when there is no speaker they are so disappointed -- that is the greatest praise. Speakers not only educate but inspire and open our eyes to new perspectives. The Spring 2010 lineup will begin with a presentation on February 19, 2010 by Professor Mzamo Mangaliso of the Isenberg School on scientific innovation and research with experiences in South Africa. Professor Mangaliso served as the President of South Africa's counterpart of the US National Science Foundation and this talk is certainly going to be fascinating and very informative. On March 5, 2010, we will be hosting Mr. Richard Brooks of ISO - New England, who will be speaking on the development of the smart grid, a topic not only timely but extremely relevant to consumers and businesses. On April 2, 2010, Professor Sheldon Jacobson of the University of Illinois will be sharing with us his research on pediatric vaccines, their pricing and stockpiling issues. Professor Jacobson's visit is co-sponsored through the INFORMS Speakers Bureau. For more information on INFORMS, and its elegant new website, please click here. Professor Dimitris Bertsimas of the Sloan School at MIT will be speaking on April 23, 2010. He is a member of the National Academy of Engineering and has garnered numerous awards for his research. He will be speaking on robust optimization. His talk is co-hosted by the Finance Seminar Series at the Isenberg School. On April 30, 2010, Professor Mehmet Gumus of McGill University in Montreal, Canada will be presenting his research on supply disruptions and selection of optimal suppliers. We may also have an additional speaker on March 26, 2010, from abroad, but are waiting for final confirmation. Full information on the titles, abstracts, and short bios of the above speakers is now available on the Speaker Series website. As one departmental chair from outside the Isenberg School said to me, this speaker series is not only educational, but we are also providing a community service -- the talks in this series are not to be missed. The sad and shocking news arrived yesterday. A colleague in my department who also held a chaired professorship and had been on our faculty at the Isenberg School of Management for seven years passed away at Brigham and Women's hospital in Boston this past Monday. He had been battling a very serious illness and had been working to the end. In fact, one of his doctoral students had defended his dissertation proposal the same day that the advisor passed away (but another faculty member stepped in). Also, my colleague had just edited a volume on healthcare. He left a wife and two doctoral students and research discoveries yet to be made. In today's local newspaper, a front page story captured another tragic death. A neighbor of ours in Amherst who a few days ago was hurt by a basketball stand in the face, had had surgery, and was recovering at Brigham and Women's hospital. He died unexpectedly last Sunday morning, at age 42. He left a wife and two young children and a community trying to understand what happened. Shocking deaths of two men, each a leader in his own way, dying a hundred miles away from home at the same hospital hours apart. I remember, like yesterday, the death of my doctoral dissertation advisor at Brown University, Dr. Stella Dafermos, who died at age 49 (I received the phone call while I was a Visiting Scholar at the Sloan School). Dafermos was working with a doctoral student at the time of her death, Georgia Perakis, who, ultimately, completed her PhD under the magnificent guidance of Professor Tom Magnanti of MIT. Professor Perakis has now been promoted to Full Professor at the Sloan School of MIT and Professor Magnanti, the former dean of Engineering at MIT, has accepted the Presidency of the new university in Singapore. As someone wrote in a condolence tribute online to the family of my deceased neighbor, it is the quality of your life that matters and not the quantity (although lucky were such greats as the Nobel Laureate Paul Samuelson, who lived fully until age 94 (and was the subject of my previous post), and Professor George Dantzig, the father of operations research, who died at age 90 a few years ago). My sincerest condolences to the families, colleagues, and friends of those who have passed on during what should be a celebratory holiday season. One must keep one's spirits up, though, for the students! The news just arrived that Professor Paul Samuelson, the Nobel Laureate, and Professor Emeritus of Economics at MIT, has passed away at the age of 94. This obituary highlights some of his immense achievements, from being the first winner of the Bates Medal to being the first American to receive the Nobel Prize in Economic Sciences. Professor Samuelson was still writing and publishing in his 90s. I remember meeting Professor Samuelson in person while I was a Visiting Scholar at the Sloan School at MIT. I had corresponded with him and had been sending him some of my papers since I was doing (and still am) work in spatial economics. His 1952 paper, "Spatial Price Equilibrium and Linear Programming," published in the American Economic Review, I have cited dozens of time. I especially appreciated his ability to use and apply the appropriate methodological techniques for model formulation and analysis in economics. Also, that paper even identified the beautiful bipartite network structure of this classical problem. One of my favorite reminiscences of Paul Samuelson was riding in the elevator with him at the Sloan School and we would also meet up in either the first floor snack shop or on the top floor dining room at which I (and those who visited me) enjoyed both the buffet lunch and the great views of the Charles River. Professor Samuelson was always well-dressed with one of his bowties on and although he was a giant in scholarship, height-wise, I could look him in the eyes. One day, as we were riding the elevator together he said to me, "Anna, have you proven any good theorems lately?" and that statement still resides with me. Coincidentally (and life is filled with coincidences, it seems), yesterday, I was in Cambridge, in Harvard Square (Harvard is where Samuelson received his PhD and his nephew is the former President of Harvard, Larry Summers). A great friend of mine, Professor Kei May Lau, was visiting from Hong Kong. She had given, the day before, a seminar at MIT and I could not miss up the opportunity to see her and to reminisce. Little did we know then that we would be hearing about Harvard and MIT again today through the death of Paul Samuelson. Above I have included a photo taken yesterday in Cambridge, which, somehow to me, captures something special. I include it as a small memorial to Professor Paul Samuelson, to his brilliance, and to his legacy. This week, the Massachusetts Board of Higher Education released a report by the Commissioner's Advisory Group on Undergraduate Education, which was charged with developing a cogent list of essential cross-cutting knowledge areas and skills that all students, regardless of major, should acquire during their undergraduate careers. Special emphasis in the months that preceded this report was placed on paying attention to the voices of employers and the citizenry. One of the 14 members of the group that prepared the report was Ray Stata, the Co-Founder and Chairman of the Board of the high tech company, Analog Devices. The report has excellent recommendations and, given that the end of an incredibly busy (but very satisfying academic semester) is now approaching, I thought that it would be appropriate to highlight some of the recommendations. The focus is on public higher education but the recommendations are universal, in my opinion. Also, I think that we are doing some things very right in the Isenberg School of Management, which includes the Operations Management undergrad program that I am closely affiliated with. The report noted that, first and foremost, college graduates must master both disciplinary and interdisciplinary content and intellectual skills and identified three categories of student learning outcomes: college level fundamentals, integrative thinking, and civic, organizational, and career competencies. In the first category, written and oral communication is stressed (wonderful), quantitative skills (way to go! ), technological/information science facility (fantastic), and knowledge of the physical and natural worlds, human cultures, and knowledge integration across disciplines (terrific!). In the second category, the following skills are identified: critical thinking and informed decision-making (sounds like my field of operations research / management science), creativity and innovation (I always try to stimulate research questions and ideas from my students), problem solving (this is what I and my students do while we are awake), and another true passion of mine -- systems thinking! As for the third category, I highlight the noted skills: personal responsibility, civic and social responsibility, and teamwork/collaboration skills. These are all experiences that we try to have our students obtain in their course projects (as well as in their numerous extracurricular activities) at the Isenberg School of Managememt. I congratulate this Advisory Group for an outstanding report! I suspect that having a technology leader such as Ray Stata in this group helped to produce this truly excellent report. As promised in an earlier blog post, I leave you with a link to some of the student project presentations that my students in the undergrad transportation & logistics class gave this past week, including last Wednesday during a major snowfall -- all the presenters showed up in the morning, despite the snow (with some being trapped on a bus until the plows came through, with numerous accidents en route, etc.). Look at the project presentations, learn, and rejoice. I applaud the students. As for the Stata name, I gave a talk at a workshop at MIT a year ago in the Stata building, which is an architectural wonder and is featured above, and last spring I sat in a middle seat en route to Frankfurt via Lufthansa, with a VP from Analog Devices on one side of me and an administrator from Harvard's executive education programs on the other side -- perfect seat-mates! What a Day for Transportation -- Projects and a Prize! I had just gotten off the phone with my former student, Dr. Patrick Qiang, shortly before 6PM last night since he was getting ready to teach his graduate class, when the email message arrived from Washington DC. The message stated that the sender could not reach Patrick and that she had some very good news, which she also shared with me. I told her that I would transmit the message to Patrick although I knew that he was teaching at that very moment. Propitiously, it was student project time, and he read the news on his laptop -- his dissertation was selected to receive the Charles V. Wootan Award from the Council of University Transportation Centers (CUTC) at a banquet in DC on January 9, 2010! Needless to say, as the Chair of Patrick's dissertation committee at the University of Massachusetts Amherst, I was simply thrilled with this news and so honored and pleased to have his hard work and research recognized in this truly significant way with a national award. The title of Dr. Qiang’s dissertation was: "Network Efficiency / Performance Measurement with Vulnerability and Robustness Analysis with Application to Critical Infrastructure." The other committee members were: Professor Ana Muriel of the Department of Mechanical and Industrial Engineering at UMass Amherst, Professor Sanjay Nawalka of the Department of Finance and Operations Management at the Isenberg School, and Professor June Dong of the School of Business at SUNY Oswego. Dr. Qiang will receive the $2,000 award at the CUTC banquet to be held in Washington DC on January 9, 2010. He was notified of his selection for the award by Robert H. Plymale, President of the Council of University Transportation Centers, and Laura Spitz, the Member Services Program Manager of the American Road & Transportation Builders Association in Washington DC. CUTC was founded in 1979 by major transportation research centers and institutes in the United States. It serves as a forum for the universities and centers to interact with government and industry. Its members number over 70 of the nation’s premier university-based transportation research and education programs. 1. Smart Grids -- this project discusses the challenges with electric power generation and distribution and what problems the smart grid with associated technologies should help to overcome. It also relates this network applicationto the transportation network models discussed in the course. This project also describes the role that ISO -- New England plays in terms of reliability for power in New England. 2. Dubai -- this project discusses traffic congestion in this very unusual city and what is being done in terms of transportation planning and development from infrastructure development and enhancements, such as the new driverless metro to automated toll and fare collections to better integration of existing modes with new modes. It also discusses the impact of the economic crisis on Dubai and Dubai World. The project also highlights the use of hybrids for taxi services and the design of maritime routes for freight transport to/from the various man-made islands. 3. The San Francisco Bay bridge -- this project traces the history of the bridge, which is one of the most widely used in the US (close to 300,000 vehicles per day, when it is open). It also highlights certain dramatic closures of the bridge (such as due to the 1989 earthquake) and the most recent one, which occurred this past Fall, with 5,000 pounds of metal falling during the evening commute. The project describes the impact of the 6 day closure because of the structural failure and the impacts of ongoing repairs to the bridge, which include, interestingly, moving necessary parts for reconstruction by barge. 4. Obama's stimulus plan and effects on transportation infrastructure in MA -- this project lays out what are identifiable so-called improvements -- from road improvements, to bicycle lane additions and changes, to ferry port construction. The students did a massive investigation of transportation projects in the state and concluded that, in effect, except for some shovel-ready projects, some of which were "on the books" for about a decade, the results are disappointing. 5. Calcutta traffic and what can be done about it -- Calcutta is the economic hub of east India. It is also the 8th largest city in the world and accommodates 15 million people. The transport system is a mix that includes mass transport and the old modalities such as rickshaws. The project will discuss the numerous problems, including the lack of traffic discipline, regular traffic jams, etc., and what can be done to reduce some of the congestion. 6. Traffic around UMass Amherst -- this project will use the network and will estimate the user travel time functions to determine the estimated travel times and optimal routes of travel. The most congested links will be determined based on different levels of travel demand. 7. The Sagamore bridge, repairs, and impacts -- this project is by a team that includes a student from Cape Cod with direct interest in this topic. 8. Gibraltar and different modes of transport, including air travel to this unique destination. (There is 1 more presentation scheduled but I don't have my notes on it). I will be posting this year's projects in a few days on the Virtual Center for Supernetworks website. As for office hours, a former student, who is now in industry in Connecticut, drove up to surprise me and we chatted for about an hour. In the conversation, he mentioned the book, "Traffic," by Tom Vanderbilt, which I gave to all of the students in my last year's transportation and logistics class (it was smaller than this year's class and my chaired funds could afford it then). He had heard an interview with Vanderbilt recently and was thrilled that he had his terrific book. Professor Levine on Cyber Forensics -- What a Talk! Yesterday, we had the enormous pleasure and educational experience of hearing Professor Brian Levine of the Computer Science Department at UMass Amherst speak on cyber forensics. I, personally, sat at the edge of my seat and took copious notes because the clarity of his presentation and the topic were brilliant. His talk attracted a large audience of faculty, staff, undergrads and grad students and even administrators. Professor Levine considers himself a person responsible for applying science to law and especially computer science in gathering evidence. He asked such interesting questions and brought up such timely topics and observations that the discussions continued for hours afterwards. For example, What does it mean to have good network evidence? How to demonstrate intent when it comes to criminal activities that are gleaned from cyber forensics? How do you pick whom to investigate? Who is it that you want to catch? We learned about the differences between cyber forensics, cyber security, privacy, and cyber intelligence. We learned about the challenges that law enforcement agencies face in the various application domains, including cyber ones. For example, in order to gather evidence (without a warrant) law enforcement can only use publicly available technology (and they had gotten caught awhile back using infrared cameras before they were publicly available and that evidence could not be used). We learned about the guid (global unique identifier), dynamic IP addresses, cryptographic hash, and even SODDI (some other dude did it). As Professor Levine mentioned in his lecture yesterday, computer scientists love acronyms. The software tool that he and his team have developed is called ROUNDUP and it has been applied in both Massachusetts and Pennsylvania and has been successful in identifying perpetrators in these jurisdictions. Professor Levine also discussed his latest research, which he calls "active tagging" and which was inspired by his work tagging turtles, which got a lot of publicity. Lo and behold, one of my doctoral students after the talk and lunch that followed surprised us with a hardcopy of The Collegian, the UMass Amherst student newspaper, which carried, the day before, a front page article on Dr. Levine's talk, complete with a photo, and a nice mention of our Speaker Series. You can find the extracted article here. What an ending to a fabulous set of speakers this Fall! I felt as though I was living an episode of CSI Amherst. Thank you all so much!!! Special thanks also to the officers of the UMass Amherst INFORMS Student Chapter and its members, who help in the organization of this very special series. This week I gave my last lecture of the semester in my undergraduate Transportation and Logistics course, FOMGT 341, and next week the students will be presenting their team projects, which I am very much looking forward to listening to. Each year there is a different theme that the students seem to resonate towards as to their projects, which they select to work on and to report on. As Charles Darwin said it well, It is not the strongest of the species that survives, nor the most intelligent that survives. It is the one that is the most adaptable to change. This year a clear predominant theme that has emerged that has captured the students' interest and imagination is the fragility of the network infrastructure, especially that of transportation. Today, CNN is reporting on Logistical Problems Could Plague Afghanistan Troop Surge, and the article is featured in CNN Politics. I have extracted several quotes from the article, which I highlight below and these quotes are powerful (and frightening enough) that I will not editorialize on them. It is clear that without appropriate infrastructure and planning for logistics and transportation networks, no enterprise, be it corporate or military (as we know in the discipline of operations research going back to World War II), will likely be successful. A lot of it is going to be dictated by conditions on the ground: Can they build the new bases, the new roads, new infrastructure to handle the influx of troops? They proceed to discuss the many obstacles: A lack of paved roads outside the largest cities are easy places... to place roadside bombs... In addition, the main way to move troops and supplies around the country is by helicopter. The country is landlocked, and no navigable waterways lead to the ocean. It's not going to be a brigade a month, because of the infrastructure piece. Air Force Sergeant Nicholas Caldwell is building a new road at Camp Wolverine and says, We [are] working hard and doing as much as we can. It would be nice if we could get some help. Recall that this is the second surge, with soldiers saying that in the first surge it took months for supplies to catch up with them. There are concerns as to where to even house the soldiers, especially given the extremes of temperatures in that part of the world in winters and summers. Clearly, as the article also recognizes, under the tight schedule not only will roads and new housing and dining facilities be necessary but also more medical facilities, more supplies, including fuel, as well as electricity. I write books for many reasons. Fragile Networks: Identifying Vulnerabilities and Synergies in an Uncertain World perhaps should be used as a textbook to educate regarding the above, before it is too late. With the UN Climate Summit in Copenhagen next week, I thought it appropriate to highlight some of our environmental research at the Virtual Center for Supernetworks. Several years back my research team received two AT&T Industrial Ecology Fellowships, which supported the environmental research at the Supernetwork Center and provided partial financial support for three graduate students. These three graduate students have since all received their PhDs and now hold, respectively, tenure-track faculty positions at the University of Connecticut, the University of Sydney in Australia, and York University in Canada. You can find the recent doctoral dissertation titles and abstracts associated with the Center here. 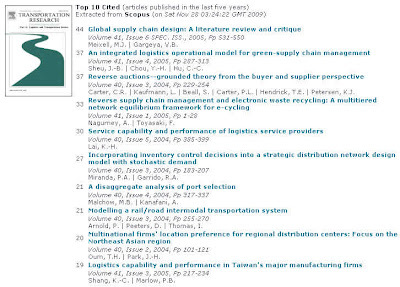 One of the publications that resulted from the AT&T Industrial Ecology Fellowships, is a top cited paper in the journal, Transportation Research E (see above), entitled, Reverse Supply Chain Management and Electronic Waste Recycling: A Multitiered Network Equilibrium Framework for E-Cycling, which was co-authored with one of my former students, Dr. Fuminori Toyasaki. Elsevier, the publisher of this journal, puts out a ranking on a weekly basis of the top cited papers (published in the journal in the last five years) and the above paper has been on this list for months now. Interestingly, the New York Times yesterday ran a front page article, In Denmark, Ambitious Plans for Electric Cars, which spoke about the partnership of the Silicon Valley company, Better Place, founded by Mr. Agassi, with Dong Energy, a smart grid company, to install and try to make feasible battery-charging stations in Denmark, specifically, Copenhagen, for charging electric cars. Denmark is providing at least $40,000 in tax writeoffs per electric car purchased and Dong Energy plans on generating a substantial portion of the electricity for the stations through wind energy. Denmark is even offering free parking to owners of electric cars in Copenhagen and I suspect that finding a parking place may not be too difficult since an earlier Times article stated that 50% of the commuters in Copenhagen commute by bicycle! As yesterday's article noted, it will be interesting to see how many consumers can overcome any psychological barriers to the use of electric cars and being dependent on battery charging stations. The article, however, neglected to mention the life cycle aspects of electric car batteries and the impact on the environment of their production and ultimate death and disposal. Nevertheless, Denmark, as well as the above-mentioned companies, should be applauded for their ability to take risks and to innovate in the environmental space. In my post yesterday, I wrote about serving on a doctoral dissertation committee for a student in New Zealand and yesterday was her dissertation defense. It was an interesting experience doing the oral defense and examination via videoconference (but this certainly reduced the carbon footprint). The student, her dissertation advisor, and the other committee members I could see on the screen in the room set up for videoconferencing at the Isenberg School of Management. They were all seated in a room at the University of Auckland in New Zealand. Given the time difference, we scheduled the dissertation oral defense at 3PM Eastern Standard time and her advisor, Professor Matthias Ehrgott, was caught in traffic so he was a bit late. The technology worked, although it did seem to be getting a bit tired after the majority of the questions were asked and answered. The student successfully passed the defense, so congratulations to Ms. Andrea Raith, a new female PhD! Her dissertation is entitled: Multiobjective Routing and Transportation Problems. I especially enjoyed her novel applications to bicycling and route choice optimization using travel time and travel safety as criteria as well as her work on the bi-objective traffic assignment problem. In addition, she identified several errors in the published literature (which the referees had not caught) and also managed to correct several of the errors. As I said during the defense yesterday, I had not refereed those papers.